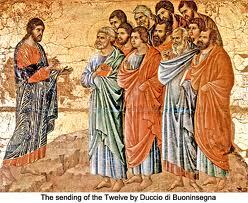 In our Gospel today, Jesus summons, sends, and shapes the Twelve for mission. How? St. Mark describes the first preaching mission Jesus gave to the Twelve, and it is full of instruction helpful to us. First, He summoned them—a call to action that organized and directed them. The initiative here is all His. After He summoned them, He sent them out two by two. Why couldn’t they go out alone? “It is not good for man to be alone.” Human companionship and mutual support would be most important on a mission like this. Jesus did not undertake His own mission alone, either. Then, “He instructed them to take nothing for the journey but a walking stick.” Why this radical simplicity? Surely it was training for the apostles to practice the single-minded dedication their vocation would require of them. They were to begin learning to take seriously the teaching of Jesus: “Do not be anxious, saying, ‘What shall we eat?’ or ‘What shall we wear?’…But seek first [God’s] kingdom and His righteousness, and all these things shall be yours as well” (Mt 6:31, 33). As God had sent Jesus into our world in simplicity to save us, Jesus likewise sent His apostles. The Twelve were to preach repentance wherever they went. When they encountered resistance, they were to “shake the dust off [their] feet in testimony against them.” Here they would engage in the prophetic drama that was often part of the prophet’s work. The Old Testament prophets were frequently called by God to not only preach a message of repentance in words but to act it out as well, so that no one could claim lack of understanding. For example, Jeremiah placed stones in a brick kiln (see Jer 43:8–13), and Ezekiel ate a scroll (see Eze 2:8–3:6). Jesus, too, used prophetic drama. One example was when He cleared the Temple of money-changers and drove away the animals used for sacrifice. He acted out for the people gathered there what would soon take place—the worship of the Old Covenant was about to be refined, purified, and fulfilled in Him. Shaking dust from the feet was a common practice in Judah for anyone who had left the Holy Land and traveled through Gentile territory. It was a demonstration of reverence for the land of the covenant and a desire to be uncontaminated by the kind of life Gentiles, who were outside the covenant, lived. In this case, when and if the Twelve used it in the face of Jewish indifference to their preaching, it would be a sharp rebuke to them, implying that they were now choosing to live outside the New Covenant God intended to make with His people. As Jesus commissioned the Twelve, He “gave them authority over unclean spirits.” This is, perhaps, the most startling aspect of their missionary work. There is no mistaking the fact that Jesus intended to share His authority with those whom He called. We see here the earliest intimations of the plan Jesus had to build a human Church and grant His own divine power to it. The Twelve “drove out many demons, and they anointed with oil many who were sick and cured them.” Here the foreshadowing of what would become the Sacrament of Anointing in the Church today. Two thousand years later, Jesus is still doing the work of His kingdom in and through men who are summoned, sent, and shaped in the ministerial priesthood of His Church. Ordinary human beings are doing extraordinary divine work among us. Praise the Lord! Possible response: Lord Jesus, thank You for calling men in every age to do Your work in our world, to be Your presence here. Our Old Testament reading gives us the testimony of another ordinary human being who was called by God to do the extraordinary work of being a prophet to people who didn’t think they needed one. Amos lived in the 8th century B.C. He was a simple man— “a shepherd and a dresser of sycamores.” He cared for living things, both animal and plant; he was not a “professional” prophet. He was not trained by other prophets, nor was he associated by blood with that vocation. Nevertheless, God called him from his birthplace in the south, Judah, to prophecy to His people in the north, Israel. The priest there was none too interested in listening to Amos, whom he thought was simply plying his trade where it wasn’t needed: “Off with you, visionary, flee to the land of Judah!” Amos, of course, could not do this, because as unqualified as he was, he was quite sure of God’s call. The skills he used in caring for sheep and trees would now be directed toward caring for God’s “flock” (see Eze 34:1-10; Ps 23), for His very own “vine” (see Ps 80:8-9; Jer 2:21; Hos 10:1). Amos reminds us that God’s plan to reach humans through humans was not new with Jesus. Israel’s own vocation was to be a kingdom of priests (see Ex 19:6), and when they fell away from that, God sent the prophets. When the whole word fell away from our vocation to be “in the image and likeness of God,” He sent Jesus to call us back to true life. Possible response: Lord Jesus, please give me the grace not to stumble over the humanity of Your Church. I desire ears to hear Your Voice as it comes through human beings. St. Paul was a man who truly understood that, from “before the foundation of the world,” God had a plan to elevate all human beings, including those of us not called to the ministerial priesthood, into His Divine Nature. This He has done by “adoption to Himself through Jesus Christ.” God has “destined us” to be “holy and without blemish before Him.” Why did God ever come up with a plan like this for creatures like us? Because He knew that when it is fulfilled, it will result in “the praise of His glory,” a phrase St. Paul repeats three times for emphasis. This must be important. The elevation of human beings to the divine is the “theme,” so to speak, of Creation. It is the goal of man’s existence. Sometimes, when we must defend the Church’s magisterial claim to be the living Voice of Jesus today, we struggle to overcome the objection to the idea that the Church can be both human and divine. However, we can see from our readings today that this idea ought not to come as a surprise. Although not all of us will have the vocation of apostle, all of us are part of God’s plan “to sum up all things in Christ, in heaven and on earth.” When this plan has been fully accomplished, we will spend eternity praising “the riches of [God’s] grace that He lavished upon us.” Today is not too soon to begin singing this glorious song. Possible response: Heavenly Father, please anchor me in the reality that Your plan, at work NOW in the world, will lead to an eternal ecstasy over Your wisdom and glory.